1. Preheat the oven to 200˚C, gas mark 6. 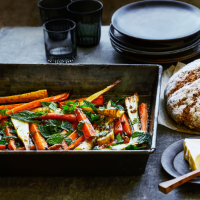 Put the carrots and parsnips in a large bowl; toss with the oil and thyme. Spread over a large baking sheet so they sit in a single layer. Roast for 30 minutes, turning halfway, until tender. 2. Meanwhile, lightly crush the cumin and coriander seeds, then, using a fork, mix together with the butter, chilli, turmeric and maple syrup. Dot the mixture over the vegetables, turning to coat with the spices. Return to the oven for 5 minutes, until browned. Stir through the chopped mint before serving.